The Spectrum Eye Drs have composed a list of ways in which to protect your eye sight . Do your eyes sting, burn or itch? You may have dry eyes, a condition that affects women after menopause, when tear production decreases. Other factors can cause the problem in people of all ages. People who work on computers or read for prolonged periods also may experience dryness because their blink rate decreases. If one does not blink every eight to ten seconds, the surface of the eye begins to dry out. Certain medications such as oral contraceptives, antihistamine and anti-anxiety meds may have a drying effect on the eyes. If you have moderate dryness, artificial tears may provide relief. If you use tears every few hours and symptoms persist, consult an eye doctor. Your eye doctor may recommend a procedure to close the tear drains in the eyes. Each eye has two tiny ducts called puncta, which drain tears into the nasal passage. Doctors can insert a silicone plug in one or both puncta to decrease the amount of tears that escape. When blood vessels in the conjunctiva - the transparent tissue covering the white of the eye are irritated, they dilate and make the eyes appear red. Often you may be able to figure out what causes the redness. If it's pollen season, for example you can guess the redness is allergy related. If you can not determine a cause, consulting an eye doctor will be necessary. At any sign of discharge or pain which are signs of infection, a doctor needs to be seen. If you scratched you eye and experience redness, pain or blurred vision, see an eye doctor. Bacteria can cause corneal ulcers that can seriously damage the eye. A feeling of something in the eye can mean a host of many things. It is very important in the initial phases of determining the cause of such, not to rub your eyes. Rubbing the eye may seriously cause an abrasion of the cornea, which in turn could lead to infection. Often just the environment that you work in, may be the culprit. Air pollution, dirt or dust blowing in the air may cause a particle to become lodged underneath the lid to cause a foreign body sensation. It is important to rinse the eye with copious saline and/or artificial tears. If the sensation is still present, then your eye care professional may need to evert the eyelid. Please remember to wear safety glasses when doing yard work or striking metal on metal ie. grinding, hammering etc. etc. Prevention is the key to and proper eyewear is essential. Eye cosmetics can cause an allergic reaction and cause a red irritated eye. If proper protocol is not followed, serious infections can result. As your hands come in contact with your eyes, any residue on the fingers can be transmitted into the ocular tissues. An allergic reaction or hypersensitivity reaction to use things as fragrances can be enough to set the eyes into a full blown reaction. The proper use of eye cosmetics is important for successful contact lens wear. Improper use of eye cosmetics will decrease your contact lens comfort and decrease your contact lens life span. In general, you will need to rule out products by discontinuing them all, then adding one product back at a time. If the cause of the irritation can not be determined, you will need to see an eye care professional. Scratches to the cornea caused by an applicator or eyeliner needs to be seen by an eye doctor. The many applications of computer technology and the accompanying use of video display terminals (VDT's) are revolutionizing the workplace of North America. Health complaints associated with VDT use proliferate, and by far, most are related to the eyes and vision. •	for those wearing bifocals; neck ache and visual fatigue. •	For your safety, all prescription eyeglass lenses should contain an ultra-violet protective covering or a special computer protective coating. •	Anti-reflection lens coatings are available for optimum comfort and reduction of glare. •	Conventional bifocals will not provide optimum visual function for computer operators. Specially designed computer bifocals will greatly increase efficiency and comfort 100%. Different jobs require different tools! •	to sit at the proper angle, height, and distance from the VDT screen. •	Place reference material as close to the computer screen as possible to avoid frequent eye and head movements. •	Place reference material the same distance from the eyes as the VDT screen to avoid having to change focus when looking from one to the other. Frequent changes may cause you to tire more quickly. •	VDT screen brightness should be 3 or 4 times greater than general room light. •	Minimize reflected glare on the VDT screen so that windows and other sources of bright light are not behind you. •	To relieve near fatigue, look at distance now and then. •	If possible, the workplace should have incandescent lighting instead of fluorescent lighting. •	Periodic vision examination is recommended to insure proper VDT vision and comfort. Fortunately, proper optometric care can help solve most of the vision problems that troubled VDT operators. Please inquire if you have any additional questions. A growing body of evidence suggests that certain vitamins and minerals may curb the biochemical events underlying cataracts and age-related macular degeneration (ARMD). The research has shown that a diet rich in fruits and vegetables along with vitamin supplements may enhance the body's defenses against cell damaging free radicals. Numerous laboratory and clinical studies have shown a link between vitamin and mineral deficiency and cataracts. Likewise, studies have found a reduced risk of cataracts in patients with high dietary intake of vitamins A, C, D, E, riboflavin, niacin, thiamin, iron and folic acid. The links between nutrition and degenerative disease suggest that vitamin and mineral deficiency may be associated with retinal degeneration and that supplements of these nutrients may play a protective role. 1	Avoid sun gazing, and wear ultra violet blocking sun glasses at all times in brilliant sun light. 2	Do not smoke, and avoid secondary smoke. If you smoke or drink, plan on taking in extra vitamin A, because tobacco keeps your body from absorbing it and drinking depletes what you already have in your body. 3	Maintain a balanced diet including fresh fruits, vegetables and grains. Cooking can change the values, as heat will destroy vitamin A and beta-carotene in foods. Also, if you don't pick up fresh food, select frozen rather than canned, as canning strips away much more of the vitamin A in food. 4	Consider antioxidant vitamin and mineral supplementation. If you smoke, drink or have diabetes, you should try to take in extra vitamin C, because your levels will tend to be lower than average. 5	Light is also destructive to C, so if you drink orange juice, it's better to purchase it in opaque plastic jugs or cartons, rather than in glass bottles. Like vitamin A, foods with C are better fresh than frozen or canned, as either process could deplete the amount of the vitamin. 6	Remember that all antioxidants are good for your body, including your eyes, but vitamins A, C and E and lutein are the most helpful to your eyes. A Liver, Egg yolk, Fish oil, Kidney, Milk fat, Dark green fruits and vegetables .Other products are cod liver oil, beef, chicken, carrots,sweet patotoe,mango and Cantaloupe Prevents night blindness. Maintains night vision. Essential for day-to-day vision.Vitamin A also prevents cataracts from forming and may have a role in preventing blindness from macular degeneration. Can lead to xerophthalmia, with dryness in the eyes, corneal ulcers and swollen eyelids. B1 (thiamin) Pork, Liver, Whole-grain and enriched cereals and breads, Legumes, Potatoes, Wheat germ Studies have shown that people who take thiamin are less likely to get cataracts. Nutrients C, E and zinc oxide are antioxidants, which prevent lens deterioration. Rapid cataracts, and more likely hood of developing macular degeneration. Lutein and Zeaxanthin Green leaves of spinach, Kale, Collards, Mustard greens, Amaranth, Spirulina, Marigold flower petals, Red paprika Protects the eyes from sun damage. Particularly helpful for people with blue, green or hazel-colored eyes. Increase risk of developing macular degeneration and cataracts. Zinc Oxide Oysters, Shellfish, Eggs, Legumes, Herring, Liver, Milk Nutrients C, E and zinc oxide are antioxidants, which prevent lens deterioration. Being eye smart at a young age can play big dividends in later life. Age-related macular degeneration is the leading cause of irreversible blindness among North Americans age 65 and older. A natural antioxidant, lutein can play a role in maintaining healthy eyes in such situations. Leading research intuitions suggest a daily intake of lutein to help ward off age related degeneration that may occur at the retinal level. Most individuals are surprised to learn they can promote healthy vision before they reach 60 years of age. Lutein is a carotenoid which is found in many fruits and vegetables. Lutein acts as an antioxidant, protecting cells against the damaging effects of free radicals. Free radicals are molecules that are missing an electron. As such these free radicals are more reactive and seek to "steal" an electron from a neighboring molecule. They can create a breakdown in cell structure. Antioxidants are able to share an electron and neutralize the reactive behavior of such molecule. Lutein is found at the retinal level and in particular the macula were vision first starts. Lutein is not made in the body and must be obtained from food or vitamin supplements. Green leafy vegetables such as spinach contain large amounts of lutein. Studies show that lutein and zeaxanthin are the predominant antioxidants found in the macula. The macula is in the center of the retina, where light is first received. Millions of photoreceptor cells laying in a flat bed help produce sharp vision which is needed to read and see objects clearly. Retinal specialists believe that macular pigment protects the retina and as such has been used to measure the health of the eye. Deeper density of pigment is thought to produce safer levels of eye health. Several factors can reduce pigment density such as, sun UV exposure, smoking, and alcohol comsumption. Dietary intake of lutein increases pigment density and helps filter out the blue light spectrum therefore reducing the damage caused by free radical damage. Nutrition experts agree that one should use 6 milligrams a day as a reliable guideline. This is equivalent to a large bowl of spinach salad. These foods provide high levels of lutein every time you eat a spinach salad or a serving of kale or turnip greens. Persons who eat large amounts of fruits and vegetables have reduced risk of age-related macular degeneration by 43 percent. Are you wanting to know how much lutein is in various foods? We have compiled a chart below per 8 oz serving. The recommended weekly intake is 42mg. Dietary supplements of lutein can complement your intake of food nutrients to effectively allow enough daily intake. •	Multivitamin Formulas. Check the label to see if lutein is included. Todays vitamin supplements ususally include lutein. An example is Centrum Silver. •	SingleNutrient. Some products contain only lutein, 6 milligrams or more. •	Look for supplements that are a purified source of lutein. This helps to ensure both quality and bioavailability. 90% of all driving decisions depend on good vision. To be a safe driver, you must develop good driving habits that depend on using your eyes. You must also know your visual capabilities and limitations, and possess the vision skills basic to safe driving. Clear, comfortable and efficient vision is important since a high percentage of driving decisions are based on what is seen, or not seen. •	Have proper glasses for day time and night driving. •	Do not wear sunglasses or dark tints at night, at dusk or in tunnels. •	Wear good quality sunglasses with ultraviolet protection in bright sunlight. •	Drive with clean glasses, windshield (inside & outside) and headlights. •	Do not stare directly at oncoming headlights. Watch the right side of the road as cars approach. •	Make certain that your car's headlights are properly aligned and your windshield wipers function adequately. •	Avoid cars with darkly tinted windshields. •	Avoid alcohol, drugs and certain medications while driving a motor vehicle. •	Keep your eyes on the road. No doubt that we all enjoy the summer months and wish to spend more time outdoors to soak up some rays. UV being what it is can cause skin damage and so generally we know how much time is enough outdoors to prevent a sunburn from occurring. And then wham! You end up with a painful sunburn. If you take a precription drug by mouth or you apply a cream to the skin, you may be in for a surprise. Some medicines are transported by the blood and deposited directly into the skin. The result can be skin that is more sensitive to light and the rays of the sun may cause a sunburn. There are many things to decrease one's light sensitivity when taking a photosensitizing drug or chemical. One should exercise caution, particularly when taking antihistamines which are present in many allergy and cold medicines and sleeping aids. Painkillers, such as ibuprofen known as Advil, or naproxen, known as Aleve are also photosensitizers. Some skin lotions, particularly after-shave, may also contain photosensitizers in the form of dyes to color them (such as eosin, acridine orange) or fragrances, such as musk. These can make one light sensitive. Since applying or starting a new drug, lotion, or cream can cause a sunburn, one needs to use the proper amount of sunscreen and to reapply it frequently. By monitoring one's time in the sun and checking for sunburn, you will limit any potential sun damage. Caution is the word when dealing with the sun. Remember, drugs by themselves do not cause sunburn, but they can act as skin photosensitizer, resulting in making the skin more sensitive to sunlight and more susceptible to burning ultraviolet UV rays. Suprisingly aspirin can decrease sun sensitivity. Aspirin is widely deposited in the skin and acts like a sunscreen to absorb the damaging UV rays of the sun before they can injure the skin. Two aspirin offer a Skin Protection Factor (or SPF) of only 2. Experts dealing in sun damaged skin suggest using a sunscreen with a SPF of at least 15, and preferably 30. Vitamin C can also have a protective effect in many cases. Certain prescription drugs and antibiotics can cause light sensitivity. Drugs such as diuretics and calcium channel blockers used to treat high blood pressure and heart failure can cause light sensitivity in certain susceptible individuals. Tetracycline, an antibiotic is well known to cause photosensitivity as are sulfa drugs and ciprofloxacin. Other examples include drugs to treat hiccups like chlorpromazine, severe rheumatoid arthritis, like chloroquine or drugs used to regulate heart rate like quinidine. One must remember that even nonprescription drugs can cause light sensitivity. Contacts can make your cornea more "porous" (OTC redness drops can dilate your pupil when your cornea is scratched. If you are using eye drops for redness, allergy, glaucoma, or other eye problems, take your lenses out before using the drops, and wait at least fifteen minutes before inserting again. Use only drops labelled for soft contact lenses. If you wear contacts overnight, its normal to need a couple of drops in the morning, and many people sleep with a bottle by the bed. It is NEVER normal to need drops all day! All aqueous drugs penetrate into spongy soft contacts, delivering several times the normal dose of medicine. Other therapeutic drops are suspensions, mixtures of oil and water, that gum up your contacts. Neither should be used while wearing contacts. Ointments can be used outside the eye (on the lids), but contacts should never be used if you have to use an ointment. Ointments containing steroids and should not be used around contacts without supervision. During the summer, most of us head outdoors to cool off whether its to the beach or the neighbor's pool. And of course, one must look one's best, and that means wearing contact lenses. Read on to find out how to protect your eyes from infections lurking in the ocean or pool side. Most contact lens wearers feel that wearing contact lenses protects the eyes against red-eye from swimming pools. It is thought that if you can smell chlorine, the water is safe and wearing soft contact lenses poses no problem. But wearing soft lenses in the pool may cause an infection to occur. Soft lenses are more water absorbing, and todays high water, high oxygen lenses have been shown to attract waterborn organisms that can cause eye infections. Properly chlorinated pools should not cause eye irritation, or for that matter fade swimwear. A chlorine smell indicates a pool needs more chlorine, which means the pool may be even a little unsanitary. Eye irritation and the chlorine smell are the result of chloramines being formed when not enough chlorine is in the pool. Chloramines react with ammonia or nitrogen compounds that may be found in the water. Chloramines found in the pool create a temporarily rough surface on the cornea. Hence the red eye. Your cornea retains more water and the resulting loss of transparency of the corneal tissue results in a haze. These symptoms will pass, and the eyes will rapidly recover if given a chance. Using artificial tears or lubricating drops will allow the cornea to feel better rapidly. Wearing daily disposable contact lenses is ideal as they may be thrown out after the water activity. All other lenses will need to be disinfected as usual. 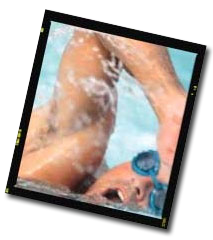 Swim goggles offer clear underwater vision and protection from the water along with UV protection. Goggles are available in both factory-made and custom prescriptions in various sizes. To have a goggle fit properly, the goggle should sit on the bone around the eye rather than on the soft tissue inside the socket. This means less pressure is required to keep the goggles on, so they will not have to be strapped, uncomfortably, tight to the face, and will allow for proper blood circulation to the head and scalp. UV-blocking contact lenses help provide protection against harmful UV radiation. However, clinical studies have not been done to demonstrate that wearing UV-blocking contact lenses reduces the risk of developing cataracts or other eye disorders. Johnson and Johnson's (Vistakon) Acuvue family of contact lenses all offer UV blocking properties. Acuvue offers all their brands of contact lenses depending on your eye care needs: Added features include UV-Blocking advantages that help protect against the sun's harmful rays, and an Inside-Out mark to make them easier to insert. ACUVUE Brand Contact Lenses block approximately 82% of the UV-A rays, and 97% of UV-B rays. UV-absorbing contact lenses are NOT substitutes for protective UV-absorbing eyewear such as UV-absorbing goggles or sunglasses because they do not completely cover the eye and surrounding area. A contact lens only covers your cornea, not your entire eye. You should continue to use UV-absorbing eyewear as directed. NOTE: Long term exposure to UV radiation is one of the risk factors associated with cataracts. Exposure is based on a number of factors such as environmental conditions (altitude, geography, cloud cover) and personal factors (extent and nature of outdoor activities). UV-blocking contact lenses help provide protection against harmful UV radiation. That is why contacts with UV blockers are designed to compliment sunglass use as an added protection. You can not tell if a contact lens has a UV blocker by looking at the lens. The UV blocker is provided in clear form, so as not to disturb vision. The contact lens packaging will specify if the product has a UV blocker. Have red, itchy eyes? Find out how to enjoy the season when pollens are flying around and making your life miserable. The topics on the right are a must read for contact lens wearers. Antihistamine medications counteract the effects of histamine. But not all histamines are created equal. The best drugs are by prescription such as Claritin, Seldane and Hismanal. Decongestants treat stuffy noses by shrinking blood vessels, which clears congestion. One must be aware of overuse of nonprescription nasal sprays. Do not use for more than two to three consective days. When one stops the medicine, the nasal tissue reacts by overdilating. Then one will need more spray to breathe through ones nose again. The nose gets hooked on the spray. If you can not get relief at the drug store, see your doctor. You may need a prescription medication, such as a nasal steroid spray that reduces the inflammation underlying allergy symptoms. If one has symptoms that last at least four months out of the year and are not controlled by other means, consider allergy shots. •	Cold compresses. Dampen a wash cloth with cold water and then place it over the eyes. •	Use nonprescription eye drops that combine antihistamine and decongestants. •	For severe or persistent symptoms, prescription medications may be needed, such as steroid eye drops. Wear sunglasses. Sunglasses greatly decrease the bombardment of pollen particles on the eyes. When an allergy inflames the nasal membranes, its known as allergic rhinitis. Allergic rhinitis that recurs each year is known as hay fever, although it has nothing to do with hay. Hay fever usually is caused by airborne pollens. This season peaks correspond to pollen seasons. Weeds, especially ragweed, are culprits at this time of year. So are wind-blown spores growing on decaying vegetation. Trees trigger reactions in spring; grasses trigger reactions in spring and summer. When symptoms last year-round, likely culprits are dust mites that grow in fabic furnishings, carpet, sofas and stuffed animals. Cats, dogs, molds and cockroaches are other indoor allergy sources. When presented with an allergen, the immune system shifts into attack, making antibodies to combat the trigger. The antibodies cause the release of chemicals such as histamine. And the chemicals create symptoms such as sneezing, congestion, runny nose and itchiness of the nose, eyes, throat, and ears. Avoid the things that make you wheeze. If you can identify what is triggering the symptoms and practise some avoidance measures, you will need less medicine. Drowsiness and impaired concentration are common side effects of over-the-counter medications. Use nonsedating antihistamines sold by prescription such as Claritin, Seldane and Hismanal. This saying is true of most sports and golf is no exception. Whether a participant or a spectator, the importance of good vision in contributing to your success and enjoyment of golf can not be overemphasized. Seeing clearly is not all that is necessary to succeed in golf. Many other visual skills affect the efficiency and accuracy of your responses. Hand-eye coordination, binocular coordination, depth perception and accurate distance visual acuity must function in perfect synchrony. If you score high in golf it is best to have poor near visual ability so that your score card will appear BLURRED and out of focus. •	Maintain optimum distance prescription. •	Wear proper tinted lenses on bright days. •	Include ultraviolet protection in all spectacle eyewear. •	Special golf bifocals are available when necessary. •	Lightweight spectacle lenses are available for your comfort. •	Special antireflection lenses are available to reduce glare. The importance of good vision and eye safety in the participation of racquet sports can not be overemphasized. To play well you must see well. To play smart you must wear protective eyewear. Eye injuries from sports like racquetball, tennis, squash, handball and badminton are the leading cause of blindness due to injury in the North America. All prescription and non-prescription sport goggles should have plastic or better yet, polycarbonate lenses for your protection. Anti-fog lenses are available to prevent fogging while playing. Never play racquet sports with glass lenses or conventional eyeglass frames. A number of interrelated vision skills must work in unison to achieve that extra edge which so often signals success in racquet competition. Many of these visual skills can be improved with professional Optometric sports vision therapy. Ask your us how we may help you. Studies shows that daily disposables such as Focus DAILIES and Vistakons 1-Day Acuvue disposables are a better choice for contact lens wearers with allergies. Daily disposable contact lens wearers reported fewer allergy related symptoms of burning and redness as compared to wearing a new pair of their usual contact lenses. More than 75 percent of contact lens wearers who have allergies experience discomfort caused by allergens present on the eye. Allergens cause your eyes to release histamines, creating redness, dryness, itching and tearing. Proteins in your tears build up on certain contact lenses and cause even more eye irritation. Tearing and build-up continue, creating more and more discomfort. •	Deposits do not have a chance to build up when you use a fresh new pair of contact lenses every day. On your worst allergy days, you can even replace them more often, if necessary. •	Minimize irritating protein deposits. •	Minimize build-up of natural oils, dirt and pollution. •	Avoid using irritating cleaning solutions. •	Reduce eye discomfort and the need to wear glasses. •	Affordable enough to replace every day. •	Freedom from cleaning lenses. There is a lot you can do to reduce the misery of allergy season. First, of course, ask your eye care practitioner about daily disposable contacts, the daily disposable that is fresh and new every day. Close windows and use air conditioning in your home and car. Avoid outdoor activities in the morning and early afternoon when pollen levels are highest. Avoid mowing and raking (or wear a dust mask and protective eyewear). Wash your hands, face and hair often to remove pollen. Avoid rubbing your eyes. Instead use cold compresses to relieve itching. Rinse your eyes frequently with eye drops (with your contact lenses in). See your doctor for a diagnosis and treatment. If you choose to wear lenses that are only replaced weekly or monthly, keep your lenses clean with a solution that leaves no chemical preservatives on your lenses such as ClearCare solution or B&L's PeroxiClear 3% Hydrogen Peroxide Cleaning & Disinfecting Solution. Both these solutions remove daily bio-film protein build up and provide superior disinfection. More on Lens Care Solutions. Breakthrough Lightstream Technology makes Focus DAILIES uniquely comfortable in comparision to other daily disposable contacts. They are made of a thin, soft biocompatible material, you will hardly know you are wearing them. Now products such as Total 1 Dailies, Focus Aqua DAILIES bring you the Comfort Edge, a smooth, clean, precise edge unmatched for eye comfort. Best of all, these dailies are as affordable as a daily cup of coffee due to Alcon/Ciba Vision's ultra-efficient patented manufacturing process. Irritating preservatives from lens care solutions can further add to the problem. Focus DAILIES prevent this cycle of discomfort right from the start. They are made of a material that is non-ionic and does not attract and bind molecules like other contact lenses can. Focus DAILIES do more than give you the comfort of a fresh, clean lens every day so essential during the allergy season. They also free you from the hassles of lens care and irritation caused by preservatives and poor cleaning methods. More than 40 percent of contact wearers unknowingly fail to clean their lenses properly maybe even you! That spells extra trouble when seasonal allergies strike. What are disposable lenses, frequent and planned replacement contact lenses? Many people now wear disposable soft contact lenses, which can be worn for either a single day or up to 14, depending on the wear schedule prescribed by the eyecare professional. Disposable contact lenses are usually prescribed in multi-packs, providing several weeks' supply at a time. Frequent and planned replacement lenses are contact lenses that are replaced on a planned schedule, most often monthly, quarterly or biannually. What's the difference between daily-wear and extended-wear contact lenses? Daily-wear contact lenses are designed to be removed each day for cleaning or replacement, and should be taken out before you sleep or take a nap. Depending on your particular eye condition and other factors, extended-wear contact lenses can be prescribed for overnight wear from one day to as many as seven before they are removed. Extended-wear contact lenses can also be prescribed for removal each day for cleaning and slept in occasionally when special circumstances arise. Eyecare professionals consider many variables in deciding between daily-wear and extended-wear contact lenses for each person's needs. There are so many different contact lenses on the market. Can I substitute another brand for the one I am currently using? No, your local eyecare professional is the only one who can recommend the right contact lenses for you. Please do NOT switch without consulting your eyecare professional. Do contact lenses offer protection from ultraviolet rays? Certain contact lenses have ultraviolet inhibitors built into the lens material. Sunglasses should still be worn for protection from the sun's harmful rays. Check with our UV protected list of contact lenses and your eyecare professional to determine which lenses have ultraviolet inhibitors, and whether these contact lenses are right for you. I have 20/20 vision, but I wish my eyes were green. Do I need a prescription for colored contact lenses? You do not have to have vision problems to wear colored contact lenses. Some people simply want to change their eye color, as colored contact lenses can be great fun. It is essential, however, that contact lenses be professionally prescribed and fitted. Contact lenses are an FDA-regulated medical device. Contact lenses that do not fit correctly (or used in an eye other than the prescribed eye) can cause serious eye problems, potentially resulting in permanent eye damage. How do tinted and opaque contact lenses work? Today's tinted soft lenses offer the fun of enhancing or changing your eye color. The color is seen on your eye, but does not affect the color of things you see. Enhancing tints give drama and added color to existing eye color, and come in a variety of colors including aqua, blue, green, brown, amber, and violet. Opaque tints cover the natural color of the iris, making the eye appear a completely different color (such as blue over a brown iris). The wearer sees through a clear area in the center of the contact lens while showing the world a different eye color. There are even visibility tints, which are contact lenses that are lightly tinted to make them easy to find but which do not change the color of your eyes. Some types of lenses also offer additional ultraviolet-radiation absorption properties. Corneal edema should never exceed 10-12%. Contact lenses restrict corneal oxygen availability. Chronic corneal edema after a number of months of extended wear can take up to seven complete days to completely resolve. In addition, it can take 5 to 10 weeks for microcysts in cornea as a result of corneal edema to completely resolve. White spots called infiltrates (a collection of inflammatory cells) can appear if there are prolonged periods of reduced oxygen levels, immune responses, solution reactions, physical irritation and local infection. They may take 1 to 2 months to completely disappear without wearing contact lenses. Your symptoms may resolve within one to two days. You should not wear lenses until instructed to do so. Particularly in people wearing their lenses on an extended wear basis typically complain of increased lens awareness, itching, and blurred vision. You may also have increased contact lens movement and heavy deposition of protein/lipids/calcium on the lens surface. Upon eversion of the upper eye lid enlarged papillae are observed. There are four common causes of GPC (Giant Papillary Conjunctivitis). Chronic hypoxia (lack of oxygen) under the upper lid, mechanical irritation of the conjunctival surface with lens movement, reaction to preservatives in solution, and an immunological reaction to environmental antigens harboring in contact lens deposits on the anterior surface of the contact lens. Always have a current prescription in spectacle glasses. During a month of wear, one should wear glasses at least 4 days of the month ALL day, and at least 2 days/wk, 2-3 hrs before going to bed. For a new contact lens wearer the most appropriate wearing schedule during the initial adaptation period is 7 hrs on the first day, then add 1 hr each additional day of wear. When you awaken, corneal edema/swelling is present, and on average this increases the corneal thickness by about 4%. It takes 30 minutes for the eye to resolve this edema. Please wait for at least 30 minutes every morning after waking before placing your contact lenses into the eyes. •	Do not sleep with contact lenses on the eye, even for long periods of time unless extended wear use has been advised by your eye care provider. •	Do not wear soft contact lenses all waking hours unless advised. All contact lens wearers should take their contact lenses out 30 minutes before they go to sleep at night. As well, give your eyes a break one day each week and discontinue contact lens wear all together. •	Do not use regular fresh or filtered tap water, or homemade saline in place of the recommended solutions. Water contains a lot of bacteria that may contaminate the contact lens. Water also lowers the salt content of the contact lenses and may cause them to adhere more tightly to the tissues of the eye. •	Do not insert or wear your contact lenses if you happen to develop a persistent red eye or eye infection. Put your glasses on and consult our your eye care provider. •	Do not wear contact lenses if you have a cold or viral infection. Please wear your glasses until the cold has completely resolved. The immune system is busy fighting the infection and contact lenses can stress the eye. Small viral products can accumulate within the cornea that may take several months to completely resolve. •	Do not use contact lenses or solutions that have expired. •	Do not wear a ripped or damage contact lens. It is beneficial to have an extra pair. •	Do not use saliva in place of the recommended solutions to wet, lubricate, or moisten a contact lens, and never put a contact lens in your mouth. •	Do not use any eye drops, eye medications, or solutions, unless specifically designed for use with soft contact lenses prior to insertion of the lens. •	Do not wipe your contact lenses with a tissue or cloth. •	Do not substitute an old, used contact lens for a lost or damaged contact lens. •	Do not store your contact lenses where they will be exposed to excessively hot or cold temperatures. You may destroy or damage the contact lenses if the solution happens to freeze or boil. Please replace the lenses. •	Do not reuse solutions after any cleaning/disinfection cycle. •	Do remember to blink fully and completely. •	Do use contact lenses rewetting or lubricating eye drops. •	Do have an annual contact lens eye examination. •	Do carry a flat storage case containing saline with you in case your contact lenses start to feel uncomfortable. •	Do replace the contact lens case every 3-4 months to prevent bacterial contamination. •	Do have a current prescription in glasses for periods you are not wearing your contact lenses. •	Do remove your contact lenses at the first sign of discomfort and redness. A thin layer of tears covers the surface of normal, healthy eyes. This fluid lubricates and protects the surface. There are several glands around the eyes that constantly replenish these tears, as they naturally evaporate or drain down and out the tear duct. Dry Eye occurs when something interferes with the tears normal production or function, leaving your eyes unprotected. Contact lenses wearers and allergy sufferers frequently suffer from Dry Eye Syndrome. In mild cases of dry eye, a slight burning, scratchy or sandy sensation is common. In moderate to severe dry eye, you might also experience frequent blinking, blurred vision, a sensitivity to light, and even reflex or excessive tearing. The most common cause of dry eye is aging when the quantity and effectiveness of your tears decrease. Anti-anxiety agents, Anti-histamines and oral contraceptive medications can also decrease tear production and cause dry eye. Environmental factors such as exposure to wind, smog, dry air, smoke, prolonged work at a computer terminal may aggravate this condition. The winter season with its cold, dry, windy weather may also increase irritation. Others include low levels of humidity, air tight office buildings and environments where pollutants and dust are at a high level. Remember contact lenses contain water so the eye can receive high levels of oxygen. They can also aggravate and make dry eye symptoms worse because...as contact lenses dehydrate they fit tighter. This can create a foreign body or loose eye lash sensation which comes from the edge of the contact lens. Depending on the edge design some contact lenses will feel better than others. Drying is also quicker in areas where there are deposits and coatings. Please be sure to physically rub both sides of all contact lenses, even disposables, for at least 10 seconds during cleaning. If your Dry Eye is environmentally related, avoiding those situations will help. Maintaining a more humid home or work environment with a humidifier. Applying an ocular lubricant regularly such as artificial tears may help. There are many different kinds of eye drops available over the counter. Some of which should NOT be used with contact lenses so be sure the label states they are safe to use with ALL soft contact lenses. Please consult your local eye care professional if you do not find relief from over the counter artificial tears, and please do NOT wear contact lenses if your eyes become red and more irritated while wearing them. Swimming...Scuba diving... and water skiing all involve interaction with water. The FDA and many contact lenses manufacturers oppose contact lens wear during water activities because of the increased risk of eye infections. But what about the improved vision and increased safety one gains by wearing prescription contact lenses? A water skier needs to see hazardous obstacles and a diver needs the improved depth perception when diving from a platform. Here are some important considerations while wearing contact lenses for water sports.............all soft contact lenses are hydrated with water, as this is how the surface of the eye receives oxygen by flowing through the microscopic pores within the lens. Unfortunately, water can also contain a lot of harmful bacteria which can stay in contact with the front surface of the eye by staying within the contact lens. The behavior and fit of soft contact lenses depends largely on the salt concentration or PH of the water. When there is a low salt concentration like a swimming pool or fresh water lake, the overall diameter of a contact lens increases and contact lenses will fit tighter. Conversely, in the ocean where the salt concentration is high, a contact lens will fit loose. The water environment is an important consideration prior to a contact lens fitting. Other harmful chemicals such as chlorine, used to kill bacteria and shock treat swimming pools, can adhere to soft contact lenses and cause an allergic or delayed reaction. Chlorine burn, a condition that can damage the cells on the outer surface and cause extremely red eyes can be worse without wearing contact lenses because it is believed they function as protective shields. The wearing of soft contact lenses in saunas, hot tubs, and during swimming is NOT recommended. There is a significant risk of loss and contamination. Bacteria in the water can cause severe eye infections. Please wear protective goggles or a mask during these activities to reduce these risks. Please note that contact lenses may absorb or retain chlorine depending on the material. It is usually an undesirable pH level that causes more ocular irritation than an excessive chlorine level. •	Use swim goggles under water. •	Take glasses with you in case you lose your contact lenses. •	Use daily disposables contact lenses and throw them away after their use. •	Fast blink to clear water from your eyes. Do not rub. •	Wait 20 minutes after your water activity before attempting contact lens removal to allow equilibration with the tears. 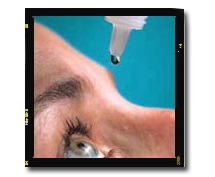 •	Use saline or rewetting drops to loosen the contact lenses. This will make contact lens removal easier. •	Be able to reinsert lenses without the aid of a mirror. •	Leave contact lenses out for a few hours after swimming. 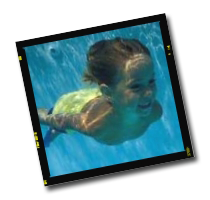 •	Carefully clean and disinfect contact lenses or replace them after each swim. If you experience blurred vision, redness or irritation, or discomfort, remove your contact lenses carefully and consult your local eye care professional immediately.